Issyk-kul means hot lake in Kyrgyz language and is the second largest salt lake in the world after the Caspian Sea and it is the 10th largest lake in the world by volume which is 1609 above sea level. It is about 182 km long and up to 60 km wide with an area of about 6236 square kms; deepest point being 668 metres. This lake is surrounded by snow capped mountains but still it never freezes. It is almost 4-5 hours from the capital city of Bishkek and as soon as you land there, you would find people asking you whether you have been to Lake Issyk-kul or not? It is fed by springs including many hot springs and the water coming from melting of the snow moreover almost about 118 rivers and streams flow into the lake; the largest being Djyrgalan and Tyup. 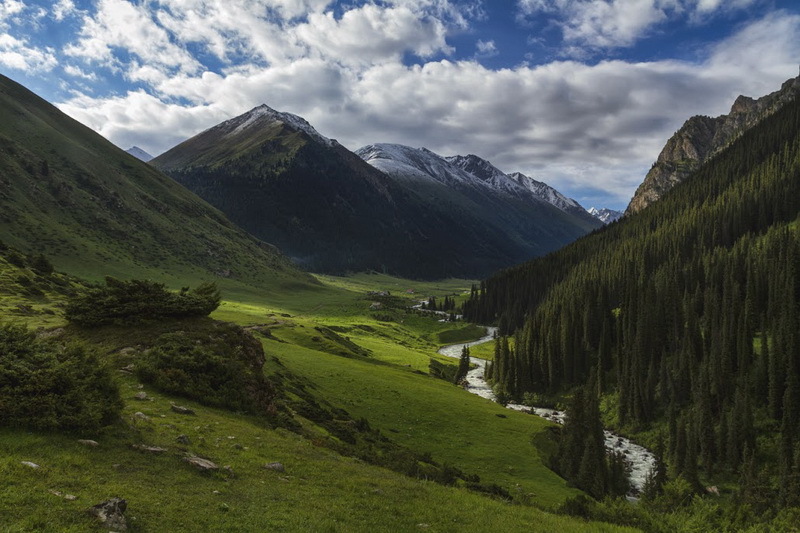 The Teskey Ala-Too range of the Tien Shan mountains mark the southern shore of Issyk-kul however the Kungey Alatau runs parallel to the north shore. This lake contains highly endemic fish biodiversity; it is a special place famous for its warm, sandy beaches, thermal mineral radon springs, alpine meadows, coniferous forests. All this lies beside the captivating and alluring peaks and glaciers including many of the highest mountain verticals. The Lake Issyk-kul has been held in high regard by the Kyrgyz – it is known as the “pearl of the Tien Shan” and in 2004, the government declared the lake as the property of the nation. It is said that the look of the Lake in itself is a geological mystery. It appears to be an inland sea at times and also has a fair number of beaches; most of which lie on the northern shore and is a big time tourist attraction. The region around the lake is well developed and has all the necessary arrangements for the tourists that is there are a good number of hotels, guest houses and home stays which can also assist you with your trek to the mountains. The major tourist activity is seen from June to September; peak season being end of July till August end. Not only is it a tourist attraction but it is believed that hot lakes can serve as a possible cure for illnesses therefore one can find effective health treatments as well. One can enjoy many nesting, resting migratory and winter birds here in this region including swans, ducks, geese, cranes etc. Since Lake Issyk-kul is walled by mountains therefore it does not experience continental climatic conditions and in summers, temperatures are generally around 25-28 degrees but the altitude can make the nights quite chilly and in winters, the temperature can drop till around -5 degrees Celsius. The Lake Issyk-kul’s waters glow with brilliant blue colour which makes it all the more attractive for the tourists to enjoy the many water sports like boating, parasailing and jet skiing.